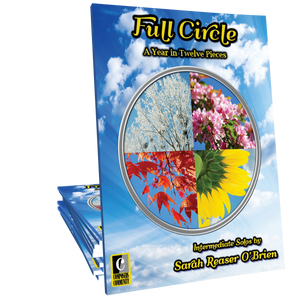 August is a new age piano solo, composed by Sarah Reaser O’Brien NCTM, for intermediate and late intermediate pianists. The pedagogical focus of this selection is small hand accessibility. The waltz-time setting and straight eighths are ideal for helping players achieve a fluid technique and a sense of forward motion. The melodic content is “hidden” within the right hand eighths and gives ample opportunity for developing sophisticated voicing. I played this piece in church yesterday. One of our professional musician members said she LOVES it and wondered if there were pieces for the other months! I said, yes--a whole book! Which I now need to purchase!